Buachaille Etive Mor was 'the one' for me for a long time. The first sight when driving into the Glen with such an iconic shape, I'd also stared across the glen at it from Bachaille Etive Beag a year before. I couldn't wait to finally start the climb. We picked a sunny day in October to head up the hill and get started on what we hoped would be a walk to rival the look of the mountain. Parking in the lay bay at Altnafeadh, we were one of only a few cars in the early hours of Wednesday morning as we loaded our rucksacks, tightened our gaiters and strolled off down the track and across the footbridge towards the hut at Lagangarbh. We could hear lots of deer in the surrounding hills but none were visible at this point. As the track started to curve up Coire na Tulaich, we couldn't believe "we're really going up that way?" It was a fantastic walk in the shady corrie, the sun not quite reaching over the peak (it being around 9am). The climb was fairly steep and before long we had gained considerable height with fantastic views across to Buachaille Etive Beag. About ten minutes before reaching the ridge, we accidentally veered off the path and the final ascent to the ridge ended up being more of a scramble than planned. It was phenomenal to finally reach the ridge, see the sun in full over the Bauchaille and have the magnificent views down the steep corrie. We had been walking around 2 hours at this point. Turning left, we followed the track up Stop Dearg and within around 40 minutes had reached the cairn at the summit, trading opinions with some fellow trekkers about just how good the view was at this point. A cloudless sky, a nip of whisky and the customary photographs made for a very pleasant end to the morning. 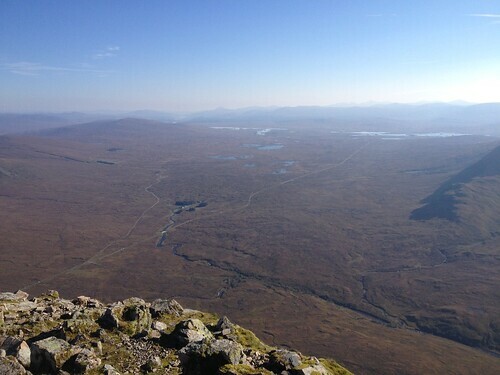 The views across to Etive Beag, down to the vast Rannoch Moor and even as far as Schiehallion were enough to make you want to spend the rest of the day sitting on the cairn here. 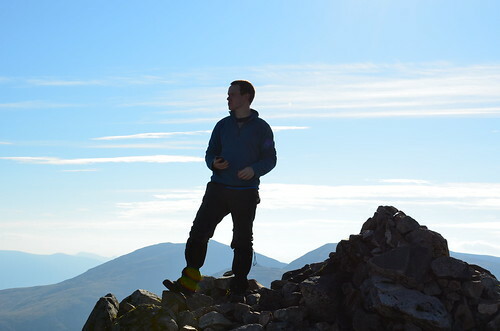 We turned and made our way back down the same path to the ridge at the top of Coire na Tulaich and gazed up at Stob na Doire, surprised that it itself isn't classified as a Munro due to the vastness of the climb ahead. 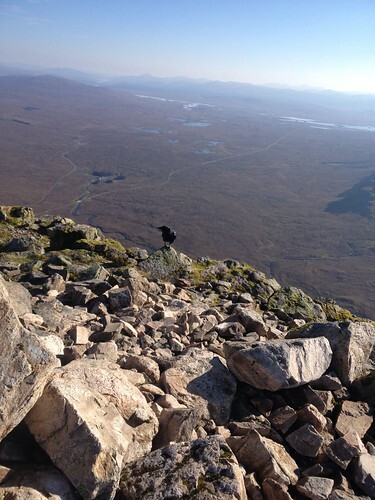 This was a tougher climb than Stob Dearg and I was more relieved reaching the top of this than the previous munro! The path was still well outlined at this point so reaching the top proved no navigational difficulty. The view was so good again that we took longer than usual to sit and the top and take in the view. Fantastic! We had been advised of the undulation of the ridge but weren't prepared for how much it would take out of us as we descended Stob na Doire as we eyed another 'peak' to climb - Coire Altruim - before the final munro. The walk along the ridge was fantastic due to the weather with superb panoramic views all around. The path became more sporadic as the ridge bears left but the direction was fairly obvious (due to the bright conditions of the day). Ridge walking on Buachaille Etive Mor. Across to Buachaille Etive Beag. By the time we reached the top of Stob na Broige the weather had turned chilly and the sky very overcast which hampered the views from here. 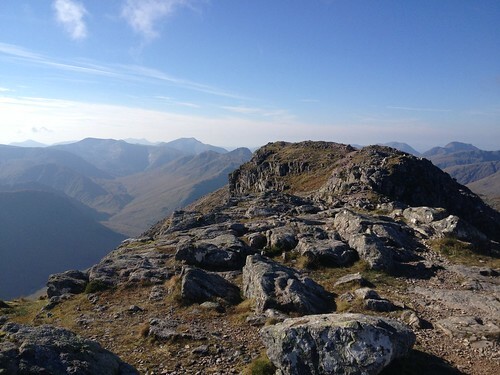 Perhaps we had been spoiled by the cloudless efforts of Stob Dearg. By this point, achey legs and chilly hands meant we were happier to 'tick this one off' and crack open the sandwiches. (We were joined for lunch here by two huge ravens eyeing us menacingly). The return leg was back along the ridge again proving no difficulty and picking up the path that climbed down Coire Altruim. This path was very steep and the going was very slow over some very slippy rocks. On the odd occasion there was a bit of clambering down as opposed to walking and in the end it was a relief to be at the bottom of this steep section. We could only be thankful that the weather was suitable that day as we imagined rain would have made this descent rather tricky. As we descended, we finally managed to spot around 10 doe's feeding on the hillside of the Buachille. Reaching the floor of the glen ("at long last! "), we followed the path we had previously used for the two passes back to one of the car parks at the side of the A82 and followed the road round for the last kilometre or so. The only problem here was a section where the only option was to walk along the roadside (the A82 being dangerous at the best of times), although this was only for a few hundred metres until we found a grassy path over on the other side of the road barrier. We followed this back to the car and then very happily, sat down! Feeling very tired and very accomplished, it was time to head to the pub and toast Munro 11 and 12. Looks like you got a great day there and some good pictures. Went along the same ridge in 1998 I think via Curved Ridge. There were five of us but I was the only one who wanted to continue along the ridge and I'm glad I did. You had great weather for this hill, it looks like summer! 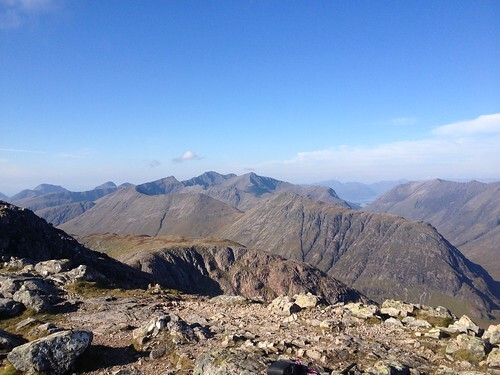 You spent your time well on Stob Dearg, admiring the views. A great place to be!